Read the Dutch bestseller, now available in translation! 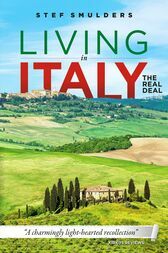 Already over 30.000 copies sold!Would you dare to follow your dream and move or retire to Italy to live La Dolce Vita? Have a Reality Check first! Would you dare to follow your dream and move or retire to Italy? Stef & Nico did, although their dog Sara had her doubts. Now from your comfortable armchair you can share in the hilarious & horrendous adventures they experienced when they moved to Italy to start a bed and breakfast.For lovers of amusing travelogue memoirs who like a good laugh. And for those interested in practical advice on how to buy a house in Italy there is useful information along the way, pleasantly presented within the short stories.Glossary of Italian words included! Learn the true meaning of Italian phrases and expressions like "non ci sono problemi", "di fiducia", "persone serie", "tutto a norma" and many more. Learn a bit of the foreign language before going to Italy.